Don’t throw the lemon grenade out. It can’t help you eliminate anything. But if you wan to enjoy your favorite coffee, the Portal 2 combustible lemon grenade mug will help you. This is an officially licensed coffee mug themed by the popular video games Portal and Portal 2. As we can see from the images, the coffee mug is shaped as a combustible lemon grenade from the universe of Portal 2, and comes with subtle details and bright color scheme from the original lemon grenade, and the Aperture Science logo tells you where the special mug comes from. Of course, the lemon grenade doesn’t actually explode, but it’s perfect to hold 12 ounces of liquid goodness, apart from that, the lemon grenade is made of ceramic. 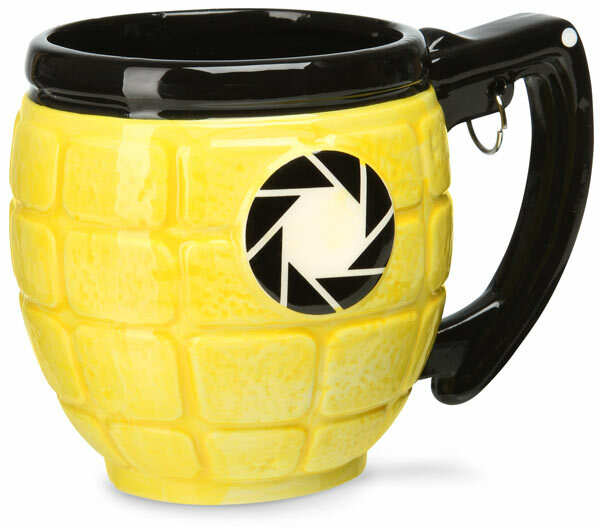 The Portal 2 combustible lemon grenade ceramic mug is priced at $21.99 USD. If you’re interested, jump to Amazon for more details. Additionally, if you need other options, you might like to check the recycle bin coffee mug and more via “mug” tag.